Sandra Gal is the first-round leader at the Women's British Open with a 3-under 69. I've seen a few analyses lately of the American Solheim Cup team prospects, but not many of the European team possibilities. Gal probably won't earn an automatic berth (although I'm not sure what the effect of her winning the WBO would be). But she seems like a good choice for a captain's pick for Team Europe. This is a video Blair O'Neal did for the Golf Channel in the aftermath of "Big Break Prince Edward Island." She talks about, among other things, her plans for LPGA Q-School and why, several years ago, she got away from competitive golf. Some good stuff. Finally! A win for Ai Miyazato. It came at the Evian Masters in a playoff against Sophie Gustafson, who birdied the final hole to get into that playoff. But it was Miyazato who birdied the first playoff hole to claim win No. 1 on the LPGA Tour. Of course, Miyazato has a ton of wins on the JLPGA, and arrived on the USLPGA with great fanfare several years ago. She's been a very solid player and has occasionally challenged, but hadn't grasped that breakthrough win until today. The Japanese media must be in a frenzy. So must The Constructivist, president of the Ai Miyazato Fan Club, who spends his spare time building likenesses of Miyazato out of udon noodles and sea urchin roe. Christina Kim likes to have fun. And as Jay Busbee of Yahoo's Devil Ball golf blog pointed out today, she's having lots of fun on Twitter. Jay pointed to this post at Golf Spelled Backwards, in which GSB publishes some of the "hot pics" Christina has posted of herself on her Twitter page. So we took at look at Christina's Twitter feed and found the photo above. Christina currently sits eighth on the American Solheim Cup points list, and with just two tournaments to go before the teams are announced she appears to be a near-lock to make the team. And we think that's great, because nobody brings as much joy, emotion and spirit to a team as Christina Kim. Anna Rawson on the red carpet, arriving at the 2009 ESPY Awards. Say hello to your 2009 U.S. Women's Open champion, Eun-Hee Ji. It's career LPGA win No. 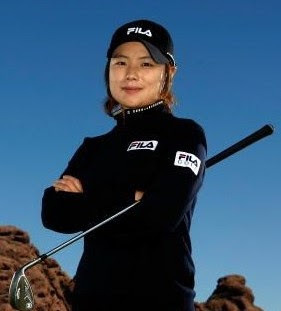 2 for Ji, whose first was at the 2009 Wegmans LPGA. Ji may seem like a surprise winner to some, since she flies a bit under the radar. 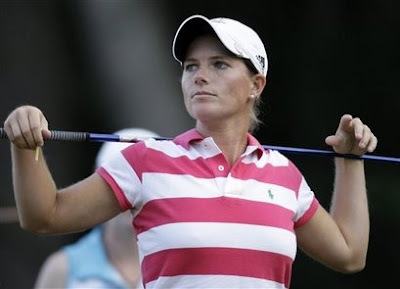 But she had four Top 10 finishes already in 2009, and she was 15th on the LPGA money list in 2008. Jean Reynolds is one of the early surprises at the 2009 U.S. Women's Open. As this is written, following completion of the second round, Jean is in third place, two strokes off the lead. So who is she? She's a player who's been on quite a hot streak this year on the Futures Tour. So far in 2009 - Reynolds' second on the Futures Tour - she has two wins, two seconds, a third and a tenth among her 10 tournaments. Not surprisingly, Jean is the leading money winner to this point. Jean joined the Futures Tour in 2008 and was solid in her rookie season, making 11 of 15 cuts and ranking in the Top 30 in scoring average. 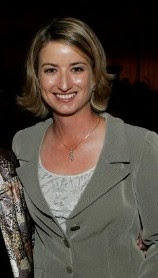 Prior to turning pro, she was a five-time winner of the Georgia State Golf Association Championship. And she did well enough in high school golf in Georgia that the state legislature honored her. "I have finally made it into the 21st century," Karrie Webb writes. What does she mean? She means that she finally has a Web site - karriewebb.com. The 7-time major champion and World Golf Hall of Fame member has a journal on the site that she appears to be updating ~weekly. In addition to the journal there are sections dedicated to Karrie's accomplishments (and there are a lot of those! ), plus her schedule, charities she supports, and so on. 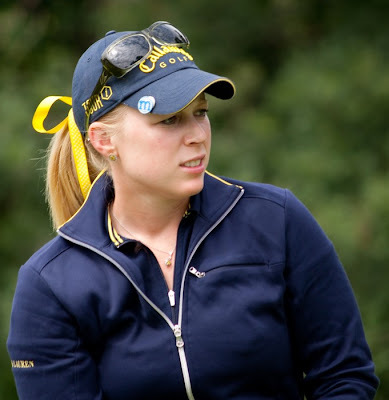 Morgan Pressel looks a little scowly in this photo, which is courtesy of GolfBlogger.com. Not sure why, since she carded a 64 today in the opening round of the Jamie Farr. Golf Blogger, by the way, is one of the longest-running golf blogs on the 'net - one of the originals. And the Golf Blogger his own self is spending time at the Farr snapping phots, which will be posted over the next few days at GolfBlogger.com. Check 'em out. If you want to get to know Tiffany Joh a little bit better - and you should, she's hilarious - then check out her new blog at tiffjoh.wordpress.com. 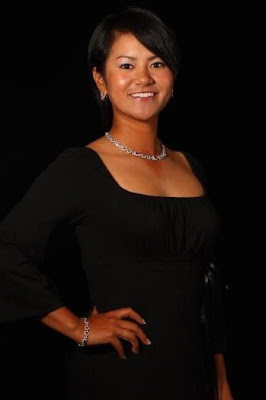 Tiffany is a multiple All-America selection at UCLA, a member of the 2008 U.S. Curtis Cup team, a two-time champion at the U.S. Women's Amateur Public Links Championship, who has just embarked on her professional career. She's now playing the Futures Tour. Some of you may remember Tiffany's posts at Waggle Room. Her new blog includes musings, musical interludes and video clips. Sometimes, as in the clip above, all three in one.